You all remember the story about a homely-looking little duck that turned out to be a beautiful swan? Well, the good people of NetEnt decided to base their latest product on this famous fairy tale written by Hans Christian Andersen. 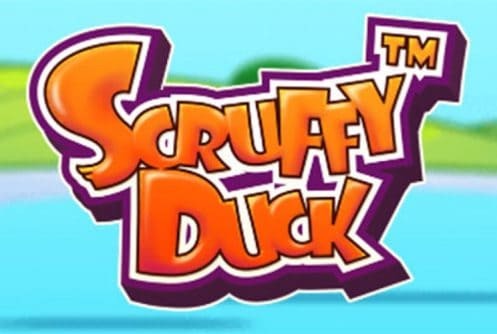 The Scruffy Duck is a five-reel, three-row video slot placed on the very pond where the ugly duckling grew up into a swan. Apart from its wretched family, frogs and mosquitos, gamers can also expect lots of fun and rewarding features, but only once they land three Free Spins Scatters. The ugly little duck will be there to help you land more payouts, serving as an Expanding Wild. Playable from only $0.25 per spin, the 2017 release offers a whopping maximum prize of 300,000 coins! NetEnt is one of the leading software development companies in the iGaming business. Being founded in 1996, the Swedes have been around since the very birth of the online gaming industry, releasing topnotch online casino games. NetEnt is the first company that developed a software for online casinos, and today more than 300 online casinos use their software. The Scandinavians are famous for their state-of-the-art video slots, which house superb graphics and excellent soundtracks. Just try out their Guns N’ Roses, Jimi Hendrix or Motorhead, and you will understand what we mean. The moment you set your feet on the pond where the reels are set, you will see that the 2017 release has a cartoonish appearance. Lots of animals await for you on the pond, the frogs and the mosquitos surrounding the reels, while plenty of ducks serve as high-paying symbols. Father Duck is a successful businessman and the symbol that pays the most, and there are also the Mother Duck, Brother Duck and Baby Duck. Playing cards in eggshells act as low-value symbols. As for the Ugly Duckling, it is actually an Expanding Wild that turns into a beautiful swan and covers the entire reel when there is a chance it will form a winning combination. Since you now met the whole family, let us talk about the rules you need to abide by while you are on this pond. The NetEnt product features a 5×3 grid and offers 25 fixed paylines, which pay starting from the far left reel. Three of a kind is a required minimum for landing payouts. To set the desired bet, adjust the coin value somewhere between $0.01 and $1. You can bet from 1 to 10 coins per line, determined by the selected bet level. Betting starts at $0.25, and the maximum possible bet you can wager is $250. 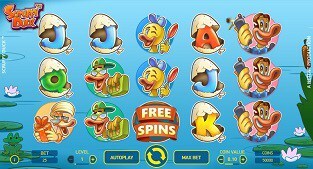 The only symbol we failed to mention in the previous section is the Free Spins Scatter, appearing only on reels 3, 4 and 5. As suggested by the name, these Scatters are crucial for triggering of the Free Spins feature. Once all three of them are on the reels, one of five options in the Free Spins feature will be activated. With the Multiplier feature you will receive 15 freebies with a 3x multiplier that applies on all winnings. The Colossal Wild feature brings 10 free spins and 2×2 or 3×3 Colossal Wilds, which appear only on reels 3, 4 and 5. These Wilds might appear in full or partially, and once part of a winning combination, they will turn into 2-9 single Wilds. In Symbol Removal gamers are awarded with 12 freebies without any of the low-paying symbols appearing during the feature. Random Wild feature will add 2-5 Wilds during each of the 8 free spins you get, only these Wilds do not expand. Last but not the least is the Double feature, where you get 6 free spins with two of the abovementioned features. If we are to believe the good people of NetEnt, the maximum possible prize punters can expect is set at 300,000 coins. We reckon that this kind of life-changing prize is achievable only through one of the Free Spins features offered. Of course, decent payouts can be expected during the base game as well, thanks to the Ugly Duckling Expanding Wild. A wise thing to do is to combine Expanding Wilds with Father Duck, since he pays the most, 400 coins for five of a kind. The 2017 release is a nice-looking slot, boasting colourful graphics and a catchy soundtrack. As for the features, they are not that easy to trigger, but can prove to be quite generous once you land those three Free Spins Scatters on the reels. The wide betting range will certainly attract both penny punters and high rollers. Plenty to play for in the Scruffy Duck for a very reasonable starting price. Since all fairy tales end with a happily ever after, we can only hope that one of you will get their hands on the main prize of 300,000 coins, which will definitely turn you into a beautiful swan.